You've heard Cyanide, you've checked out The Day That Never Comes, and now you can feast your ears on another new Metallica song in its entirety, My Apocalypse. Metallica have offered the track for streaming right here. The five-minute cut is a breakneck-paced monster, reminiscent of their tempos of yesteryear. 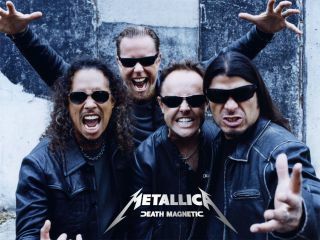 To our ears, it's clear indication that Death Magnetic means business. A message on the band's website states: "Keep coming back Monday nights before September 12 for a full taste!" Does this mean the entire album will be streaming by then? We shall see. Update: My Apocalypse is now available to buy on iTunes.